Thomas Moran saw the wondrous landscape that the world would come to know as Yellowstone National Park for the first time in the summer of 1871. He had journeyed west to join F. V. Hayden's survey expedition bound for a region rumored to contain steaming geysers and boiling mud pots. Traveling by train and stagecoach, he arrived in Virginia City, Montana, where he met William Henry Jackson, a young photographer whom Hayden had hired to document the purported "Wonders of Yellowstone." Moran and Jackson quickly became a team, working side by side to select subjects for photographs and sketches. Together they gathered the first visual evidence confirming stories of an astonishing region in the Far West full of geological marvels. Hayden, Moran, and Jackson returned east in the fall of 1871. Required to submit a report to Congress, Hayden supplemented his survey data with photographs taken by Jackson. Soon Congress began drafting legislation to protect Yellowstone. In support of the proposal, Jackson's photographs and Moran's watercolors (the only color images available) were passed among congressmen on Capitol Hill. With nearly unprecedented speed, Congress approved a bill declaring Yellowstone the nation's first national park in the spring of 1872. 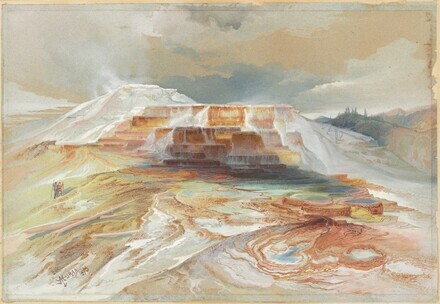 Moran's watercolors of Yellowstone were so admired that within a short period of time the artist received multiple invitations to join government-sponsored expeditions to western territories. In 1873 he accompanied John Wesley Powell on a journey down the Colorado River to the Grand Canyon. That same year, William Henry Jackson photographed Colorado's "Mountain of the Holy Cross." When Moran saw the photograph, he quickly recognized a subject perfectly suited to his brush. The following year he traveled to the Rocky Mountains, where he undertook an arduous climb to complete field studies of the celebrated mountain with a cross of snow near its summit. During the following decades Moran traveled west many times. In the field and later in his studio, he produced a number of stunning watercolors that introduced the remarkable canyons, peaks, and geysers of the Far West to the American people. Critically important as historical documents, Moran's western watercolors are also among the most beautiful paintings produced during the nineteenth century. The artist; Dr. John A. Mitchell's aunt, 1918-1919; Dr. John A. Mitchell, Interlaken, Massachusetts, 1919-1970? ; (Kennedy Galleries, New York); Robert H. Levis II, by 1980; (sale, 19 October 1997, Sloan's Auction House, Bethesda, MD); private collection, 1997; acquired by NGA, 2012. The Most Remarkable Scenery: Thomas Moran's Watercolors of the American West, Amon Carter Museum, Fort Worh, May 23-July 13, 1980; Cleveland Museum of Art, August 5, 1980-October 5, 1980; Yale University Art Gallery, October 23, 1980-January 4, 1981, no. 49, 92 (b/w ill.). Curry, Larry. The American West: Painters from Catlin to Russell. Los Angeles County Museum of Art, 1972, no. 107, 157 (b/w ill.), 190. The Kennedy Quarterly. 11 (March 1972), no. 154 (b/w ill.), 202. Clark, Carol. Thomas Moran: Watercolors of the American West. Amon Carter Museum/University of Texas Press, 1980, no. 92 (b/w ill.), 130. Kinsey, Joni L. Thomas Moran's West: Chromolithography, High Art, and Popular Taste. Lawrence, Kansas, 2006: 66-67, 89-90.